CHICAGO (AP) -- The white Chicago officer who gunned down a black teenager in 2014 was sentenced Friday to nearly seven years in prison, ending an explosive case that was centered on a graphic dashcam video and added fuel to debates about race and policing and law enforcement's "code of silence." Jason Van Dyke was convicted last year of second-degree murder and 16 counts of aggravated battery - one for each bullet fired at Laquan McDonald. He barely moved upon learning the sentence. 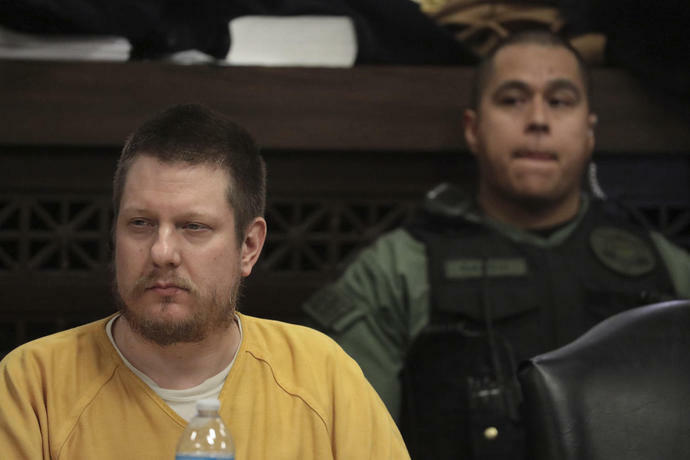 Moments earlier, Van Dyke acknowledged the teen's death, telling the judge that "as a God-fearing man and father, I will have to live with this the rest of my life." The sentence was less than half of the penalty that had been sought by prosecutors, who asked for 18 to 20 years. But it went far beyond the request of defense attorneys, who argued that Van Dyke could be released on probation. The prison term was also a fraction of what Van Dyke could have faced had he been convicted of first-degree murder, which carried a mandatory minimum of 45 years in prison. Attorneys on both sides agreed that if he behaves in prison, Van Dyke could be released in less than three and a half years. The lead defense attorney, Dan Herbert, said Van Dyke "truly felt great" after the sentencing. "He was happy about the prospect of life ahead of him" and someday being reunited with his wife and two daughters. The prosecutor who oversaw the case said he can live with the sentence. "Our goal was to find the truth, present the truth and ask for justice. ... It was not revenge," special prosecutor Joseph McMahon said. Judge Vincent Gaughan's decision to deem the second-degree murder conviction the most serious crime -siding with the defense on that question - may also have spared Van Dyke a far longer term behind bars. Had Gaughan sentenced Van Dyke on the 16 counts of aggravated battery, as prosecutors asked him to do, he could have faced decades in prison. Each aggravated battery count carried a mandatory minimum of six years, and the judge could have ordered those sentences to be served one after the other. After the judge's announcement, Van Dyke's father said, "They threw him underneath the bridge." His older daughter began crying and said "I want him home." The case triggered large street demonstrations when the video emerged, and authorities prepared for potential unrest in October, when the verdict came out. But there were no sign of protests following the sentence. Activist William Calloway called the sentence "a slap in the face to us and a slap on the wrist" for Van Dyke. The issue of race loomed over the case for more than four years, although it was rarely raised at trial. One of the only instances was during opening statements, when special prosecutor Joseph McMahon told jurors that Van Dyke saw "a black boy walking down the street" who had "the audacity to ignore the police." Earlier in the day, several black motorists testified that the officer used a racial slur and excessive force during traffic stops in the years before the shooting. One of those witnesses, Vidale Joy, said Van Dyke used the slur after pulling him over in 2005 and at one point put a gun to Joy's head. He said Van Dyke "looked infuriated" and seemed "out of his mind." Under cross examination, Joy acknowledged that he did not allege Van Dyke used a slur in his first accounts of the stop. Another witness, Ed Nance, struggled to maintain his composure as he looked across the room to identify Van Dyke. Testifying about a 2007 traffic stop, he said the officer cursed and slammed him on the car's hood, grabbed him by the arms and pulled him to the squad car. Van Dyke's relatives tried to defend and humanize him, saying he's a good father and not racist. Friday's testimony came a day after a different judge acquitted three officers accused of lying about the shooting to protect Van Dyke, who was the first Chicago officer found guilty in an on-duty shooting in a half century and probably the first ever in the shooting of an African-American. At the sentencing, McDonald's uncle read a letter written from the slain teen's perspective, telling the court that Van Dyke killed him without provocation. "I am a 17-year-old boy, and I am a victim of murder," Marvin Hunter said. "I am unable to speak in my own voice" because an officer "thought he would become judge, jury and executioner." In asking for a long sentence, Hunter added: "Why should this person who ended my life forever ... who has never asked for forgiveness ... be free when I am dead for forever?" Van Dyke's wife said her life has been "a nightmare" since her husband was charged. She said she was denied a job and her daughter was not accepted into a dance group because of their last name. If Van Dyke goes to prison, she said, her biggest fear is that "somebody will kill my husband for something he did as a police officer, something he was trained to do." She looked up over her shoulder and addressed the judge directly: "His life is over. Please, please. He has paid the price already ... I beg for the least amount of time." During her testimony, Van Dyke wiped his nose and eyes with a tissue while seated at the defense table in a yellow jail jumpsuit. On Thursday, Cook County Judge Domenica Stephenson cleared former officer Joseph Walsh, former detective David March and officer Thomas Gaffney on charges of obstruction of justice, official misconduct and conspiracy. Stephenson accepted the argument that jurors in the Van Dyke case rejected: that the video that sparked protests and a federal investigation of the police force was just one perspective of the events that unfolded on the South Side. The judge said the video showed only one viewpoint of the confrontation between Van Dyke and the teen armed with a small knife. She found no indication the officers tried to hide evidence or made little effort to talk to witnesses. "The evidence shows just the opposite," she said. She singled out how they preserved the graphic video at the heart of the case. The video showed Van Dyke opening fire within seconds of getting out of his police SUV and continuing to shoot the teen while he was lying on the street. On the footage, the teen is seen collapsing in a heap after the first few shots. Bullets kept striking his body for 10 more seconds. Police were responding to a report of a male who was breaking into trucks and stealing radios on the city's South Side. City Hall released the video to the public in November 2015 - 13 months after the shooting - and acted only because a judge ordered it to do so. The charges against Van Dyke were not announced until the day of the video's release. Associated Press video journalists Noreen Nasir and Teresa Crawford also contributed to this report. Follow Michael Tarm on Twitter at http://twitter.com/mtarm . For more stories about this case, visit AP's Laquan McDonald hub .